This is an all season Sweat Pant that is soft and super comfortable. It is made from a lighter-weight 100% Cotton Campcloth than the Geyser Sweats or the Winter Weight Play Pant. Nice straight legs so you can wear them outside the gym without the workout pants look. It has a soft absorbent "flannel feel" on the inside next to your skin and the fabric is twilled on the outside. Note: Pants are styled for Women or Men. Side pockets and an elastic waist w/ functional drawstring. 100% Non-GMO, USA Grown Cotton! MEN'S SIZING: S, M, L, XL, & 2X. This is the one that you'll reach for when you want the comfort of a sweat pant without quite as much warmth. NOTE: The Average Waist Size measurement in the chart is the manufactures sizing - the additional measurements below are actual size measurements. So a "Small" 30-32" Average Waist Size is actually a measurement of 24" (unstretched) to 39" (max stretched size). Average Waist Size 30-32" 32-33" 34-36" 36-38" 39-42"
A: Relaxed Waist Circumference, measured w/o pulling waist band tight. 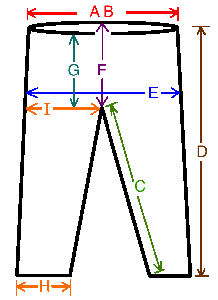 24" 26" 28" 30"
B: Pulled Waist Circumference, measured pulling waist band as far as possible 39" 41" 43" 45"
C: Inseam: Crotch to bottom of hem 29" 31" 32" 33"
D: Outer Seam: Waist to bottom of hem 39" 41" 42" 44"
E: Hip Circumference: measured around widest hips (8" down from waist band) 48" 50" 51" 53"
F: Back Rise: back waist band down to crotch seam 15" 15.5" 15.5" 16"
G: Front Rise: front waist band to crotch 14" 15" 15" 15"
H: Ankle Hem Circumference 16" 18" 18" 18"
I: Widest Leg Hip: Widest part of hip fabric from crotch to side seam 13" 14" 15" 16"